As I mentioned before, you will notice that red dots appear between the high and low of ‘inside bars’. BEWARE: You may notice that there seems to be an anomaly. If you let the chart develop during the day, some dots may appear on bars that are blatantly not inside bars. This tutorial gives an explanation of why this is happening and how to avoid it. When applying studies (show-me studies, indicators etc) to charts, you are given various options. 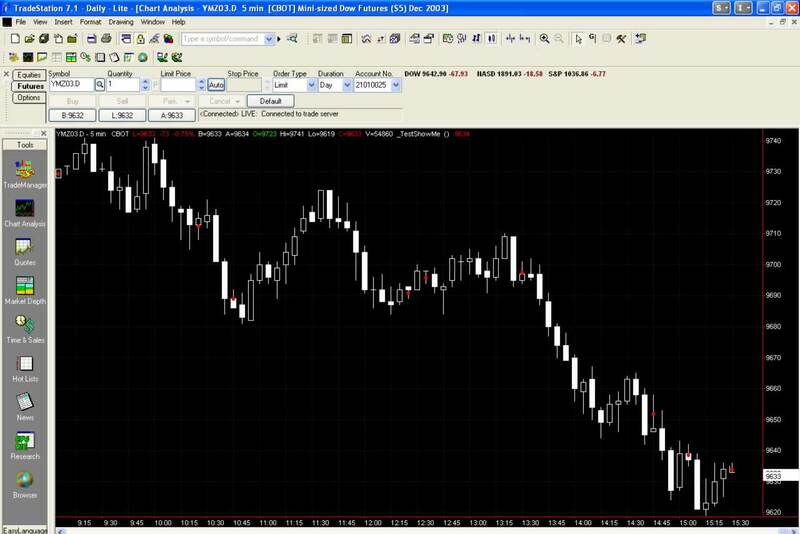 With the chart open and the show-me study applied, click on Format – Analysis Techniques. I have circled the Update value intrabar option. If this option is not selected then the ShowMe study is calculated at the completion of the bar – in other words, in our case, if the bar is an inside bar when the bar closes then a red dot will be added to the chart. If the bar does not fulfill the ‘inside bar’ condition at the end of the bar – then nothing is plotted. If this is option is selected then the study is recalculated WITHIN the bar. Practically speaking, this means that with the study as it is currently written, if the ‘inside bar’ condition occurs during the formation of the bar – then a red dot will be plotted, The red dot will remain on the chart – even if the condition is no longer in force when the bar closes. If during the bar Condition1 is no longer true, then the plot is removed from the chart. By using this technique it is possible to have your indicators appear without having to wait until the bar has fully formed, while at the same time removing any ‘spurious’ indicators.